As a director, Ang Lee has never been associated with formal experimentation. Even at their most beautiful, his films evince a sensibility that’s more adept craftsman than daring artist—Lee takes his biggest risks with his eclectic choice of subjects than with his shots and cuts. With Life of Pi and now Billy Lynn’s Long Halftime Walk, however, Lee appears to be trying to shake up his normally careful style. He embraced 3D with the former, coming up with arguably one of the most visually arresting of stereoscopic films, totally immersing us in the main character’s struggle for survival on the high seas. In the latter, Lee takes an even bigger gamble: He ups the ante on the 48 frames-per-second rate Peter Jackson employed for his Hobbit trilogy by filming an Iraq War drama in a whopping 120 fps. After Jackson’s failed experiment, one would be forgiven for having little but skepticism for Lee’s choice of shooting formats. Sure, the CGI in the Hobbit films for once felt better integrated into the live action than it usually does in regular 24 fps, but that’s just because 48 fps made everything else around its special effects seem just as artificial. Instead of more believably drawing us into its fantasy world, the higher frame rate distracts us from it. And yet, with an early image of Billy Lynn (newcomer Joe Alwyn) getting up from a hotel bed in a hungover state, one can immediately grasp what it is that Lee sees in 120 fps: The movements of the actors more successfully approximates “reality” than any of the blurry action in the Hobbit movies. Combined with 3D and 4K resolution, Lee wants to bring us closer to the action—and perhaps to the characters themselves—by creating a closer visual analogue to the world around us than is possible in 24 fps. That’s the intent, anyway. 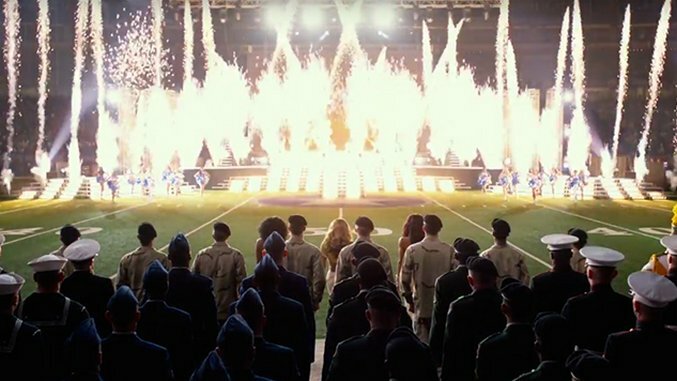 But however you ultimately feel about the hyper-real look of Billy Lynn’s Long Halftime Walk, all this obsession with technology and its ability to simulate reality is hardly enough to erase the fact that, when it comes to truly immersing an audience in a world and its inhabitants, nothing will beat the time-honored perfect storm of astute acting, writing and directing. On those fundamental levels, Lee’s film falls short. The film is based on Ben Fountain’s 2012 novel, which has been called the Iraq War equivalent of Catch-22 in its savage satire. Lee, though, has never really demonstrated much of a knack for that kind of black humor in the past. He’s nothing if not sincere, and perhaps somewhat predictably, he and screenwriter Jean-Christophe Castelli have sanded off the caustic edges of Fountain’s book to make something more earnestly dramatic. That in itself is hardly a problem: Some of the satire—the most potent of which is borne out of the attempts by people like Hollywood producer Albert (Chris Tucker) and Dallas Cowboys owner Norm Oglesby (Steve Martin) to exploit Lynn and the rest of his Bravo Company troupe to try to sell the war to the masses—survives, and of course no movie adaptation of a book needs to adhere to the letter or even to the spirit of the book to be successful. More disappointing is that, for all its beautifully observed and emotionally affecting moments, Billy Lynn’s Long Halftime Walk isn’t necessarily adding anything revelatory to our understanding of the fragile psyches of soldiers in the long arm of the United States’ hawkish war machine. Clint Eastwood, for example, already explored the same more effectively in his World War II drama Flags of Our Fathers—and doing so by dramatizing real characters and incidents, to boot. Which is why it’s doubly a shame that, unless you live in a handful of big cities, relatively few people will get to see Lee’s film in his intended 120 fps, 3D, 4K format. A regular 24 fps, 2D presentation merely magnifies the mustiness of its themes; by contrast, the startling clarity of the higher-frame-rate, high-resolution image adds a wholly visual layer to its desire to shine a crystal-clear light on the psychologically scarred human beings behind the jingoistic public spectacle. Nevertheless, there is one distinguished element that isn’t diminished in the standard viewing format: Joe Alwyn, whose performance as Billy Lynn is remarkable in the inward quality he manages to convey with a minimum of outward fuss. In an experimental film marked by a sense of technological ambition, Lee’s most lasting discovery may well be this first-time performer. Based on this one performance, Alwyn appears to have the emotional resources to scale even greater acting heights in the future. Whether the same will be the case for high-frame-rate cinema remains to be, literally, seen. Kenji Fujishima is a freelance film critic, contributing to Slant Magazine, Brooklyn Magazine, The Playlist and The Village Voice. He is also Deputy Editor of Movie Mezzanine and former editor-in-chief of In Review Online. When he’s not watching movies and writing and editing film criticism, he’s trying to absorb as much music, art and literature as possible. He has not infrequently been called a “culture vulture” for that reason.